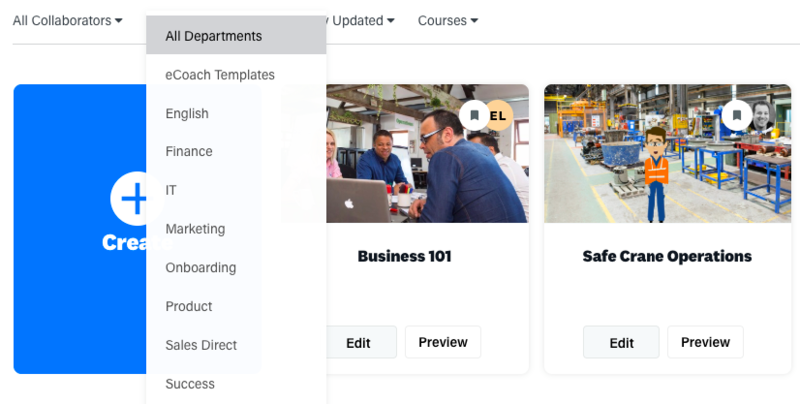 If you find that you're collecting more and more Lesson's, Quizzes, and Courses under the Create tab, while finding it more difficult to spot the exact Module you're after, you might find it useful to utilise our handy Filtering options. Use the first filter to view all Collaborators content or just the content you've created. 2. Use the second filter to view content by Department. 3. Use the third filter to view content ordered by recently updated, Alphabetical, or Creation Date. 4. Use the fourth filter to only view Courses, Lessons, or Quizzes.